When a storm hits your community with tumultuous winds, your property can suffer considerably, whether it’s a home, business or surrounding land. When the gusts of wind hit full force during the most severe thunderstorms, power lines can fall down, trees can topple over, and debris can fly all over, ending up in unusual and inconvenient places for you. 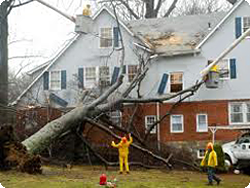 When you walk outside the morning after a storm and notice branches in the yard, along with shingles and other debris, or if your siding has taken a major hit from the weather, give Premier Restoration of Toledo a call. Our specialists in wind damage repair will come out for a free consultation to assess the situation, and before we leave, we will give you our suggestion for the best plan of action. If your home is no longer safe because of the extensive damage, we can also board up any broken windows or other gaps in walls, and we can also tarp your roof until the restoration and repairs have taken place. Whether your structure has experienced damage to walls or windows from debris or falling trees, or roof damage from wind, hail and the elements, we provide full remediation services, done quickly and correctly the first time. In some cases, debris from high winds ends up causing damage to windows, roofs and doors, but it can also lead to significant structural damage to your property. As part of our assessment property, Premier Restoration will look at any structural weaknesses that the storm may have caused to your property. We work with insurance companies (both residential and commercial) to help you file the claim and begin the remediation and restoration process as quickly as possible. That way your property returns to its original condition. With our considerable experience and highly trained staff, you can rely on Premier Restoration to bring your property back, so that you can get back to your everyday life. After we are through cleaning up your property, it will look as good as new, and it will be a safe place for your neighbors, friends, family, employees and customers to visit. Premier Restoration has built a solid reputation in wind damage repair and restoration, second to none in terms of quality and custom service. No matter what type of storm has caused wind damage to your property, we can restore it to its original condition quickly and at or under our estimated cost. We provide the best in terms of response time, so that you aren’t having to wait weeks to move back into your home or to occupy your offices. Give us a call today at 419.309.9051 to start the wind damage restoration process! Return to Premier Restoration Toledo. We love to hear from our customers on how we’re doing. Premier Restoration technicians provide highly specialized restoration services to the greater Toledo, Ohio area. Utmost care is taken with your valuable and sentimental items. Whether you are a home or business owner, we will work within the framework of your insurance policy to restore your property. One call puts our team of professionals to work for you. Our weather forecast: snow - ice - thawing - cold. Then repeat. Again and again! Experiencing ice dam buildup on your roof or flooding in your basement? We can help. Just give us a call...and remember to stay positive. Springtime is just around the corner! Premier Restoration © 2019 All Rights Reserved.